Coloured caricature print designed by George Woodward and published by S.W. Fores of No. 50 Piccadilly. This caricature was produced as a satirical comment on the way the Battle of Trafalgar was reported in the British and French press. 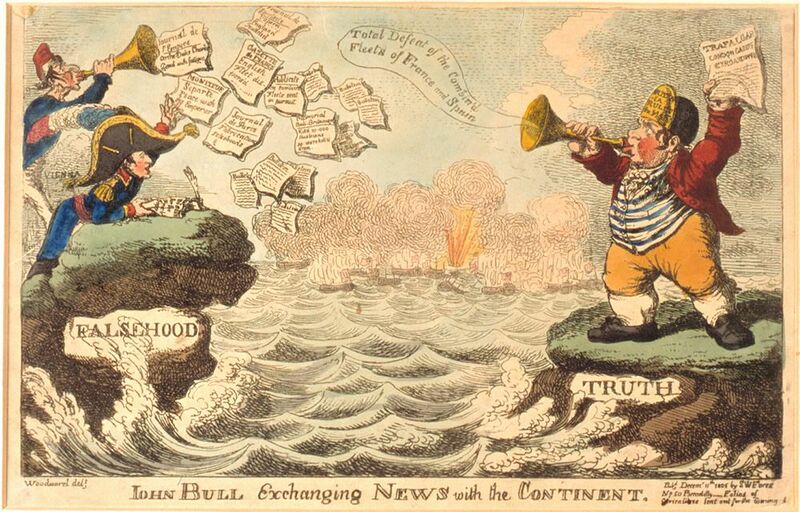 It shows the figure of John Bull standing on a coastline labelled 'TRUTH', facing Napoleon on a coastline labelled 'FALSEHOOD'. John Bull is waving a copy of the London Gazette Extraordinary, whilst a flood of papers comes from Napoleon's side reporting versions of a French victory. Between the two figures is the sea with the battle in the background. This John Bull Exchanging News with the Continent Art Print is created using state of the art, industry leading Digital printers. The result - a stunning reproduction at an affordable price.